You cut to continuity to order action covered in multiple shots. 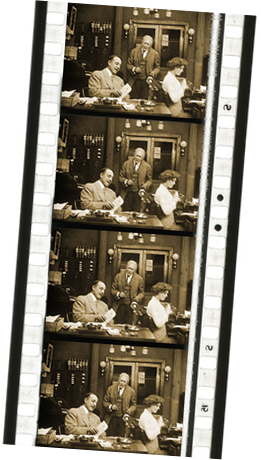 The clip on the left from I Cover the Waterfront (1933) demonstrates cutting to continuity. It's the work of Grant Whytock, who edited major movies of the 1920's like Blind Husbands, The Four Horsemen of the Apocalypse, and Greed (the eighteen reel version). Edwin S. Porter was already cutting to continuity in 1903 in The Great Train Robbery and elsewhere. 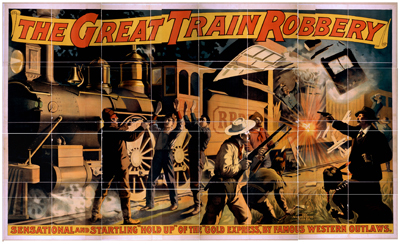 It was December 17, 1903, two weeks after The Great Train Robbery opened. By the afternoon when The Boston Evening Transcript printed this dog-that-didn't-bark story, every major exhibitor in metropolitan New York had purchased prints of the movie. The Great Train Robbery was now showing everywhere. 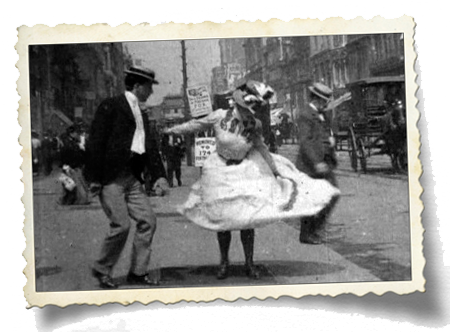 A nine minute stroll brought you in 1903 from this Manhattan corner (19th Street & 6th Avenue) to Edison's 21st Street studio, where Porter assembled The Great Train Robbery. Edison Studios decamped to The Bronx in 1907. 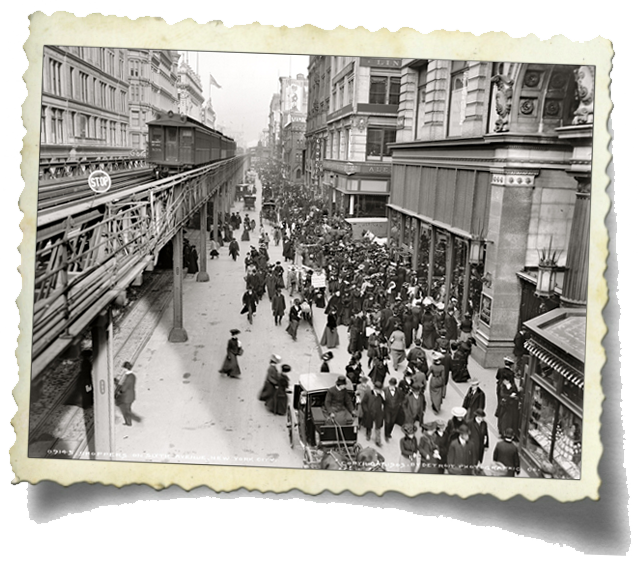 En route to Manhattan circa 1905, trailing the man with the white cloth flag, the Empire State Express of the New York Central Railroad inched down Washington Street in Syracuse, New York. 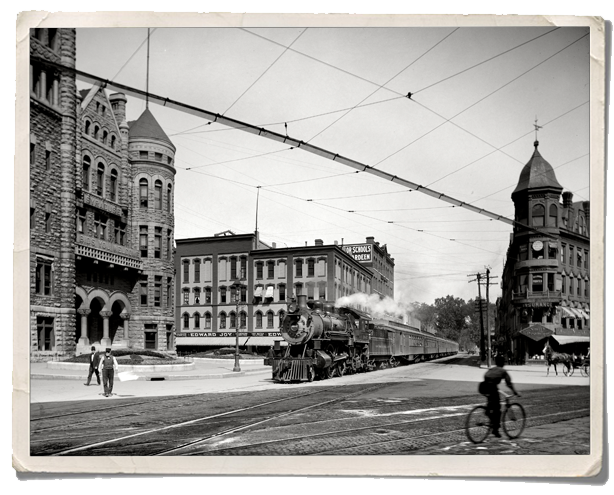 In 1896, Biograph— at Hammerstein's Theater on Broadway—premiered their widescreen projection system with a twenty-four second movie of the Empire State Express sweeping through a curve in the tracks in Canastota, New York. Wiliam Kennedy Dickson shot the scene. Beside the tracks, workmen cheered. From windows and doors on the three car train, women fluttered white bandanas. As parallel depressions in the tarmac, only hints of the tracks in Syracuse remain today. At Mr. Edison's rooftop studio at 41 East 21st Street, Edwin S. Porter has instructed you to cut to continuity the movie he shot over several days in New Jersey and in studio. Before you judge how to assemble shots of The Great Train Robbery, analyze how Porter himself ultimately sequenced them. 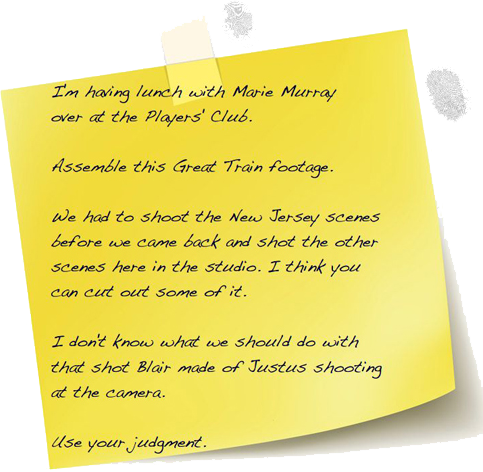 You Did It Then: Preview the four studio shots and the nine location shots Edwin S. Porter made into The Great Train Robbery. Consider how he worked out the rudiments of matte shooting, too. Then recut the movie, doing whatever seems useful to narrate a story with tension, interest, and significance. Feel free to delete elements (such as excessive footage), add elements (such as sound, visual effects, or transitions), or otherwise modify these shots for contemporary viewers. Step by step instructions and the component shots are in the button to the right. 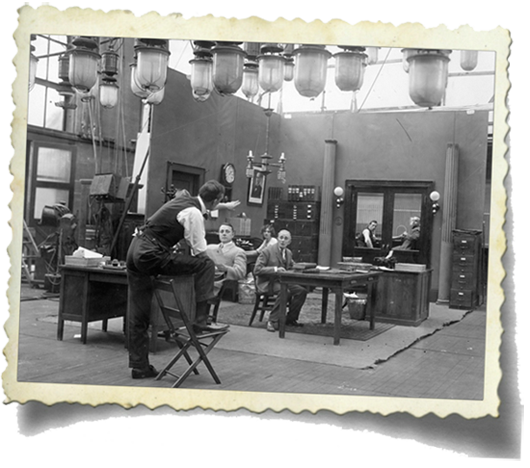 On a set inside the Edison Studio in The Bronx, director Charles Brabin blocks a shot for Hope, a Red Cross Seal Story (1912). Actor George Lessey fingers a Red Cross brochure and actress Gertrude McCoy attends from a desk at the center of the shot. Electric lamps dangle from above to soften sunlight from wrap-around windows. Flats enclose a room that never was. Pillars make exclamation points beside the door frame. (The camera never tilts upward). Above, the shot on the left as it appears in Hope, a Red Cross Seal Story. Poster for the 1896 Scott Marble melodrama that inspired the movie. The movie ignited the nickelodeon industry.